Labor Day is a commemorative celebration celebrated in many countries of the world to remember the struggle of the labor movement and the reduction of the working day to 8 hours. Although it is not properly a holiday like Christmas or Easter, it does not lack traditions; In Rome, for example, Labor Day is often celebrated, with a trip out of town. The typical thing is to meet with a good group of friends, leave the city and immerse yourself in nature. Clearly, a gastronomic tradition could not be lacking: they usually eat raw fava beans with Pecorino Romano cheese. This is a typical cheese from the Lazio region (where Rome is located) and is made with sheep’s milk. 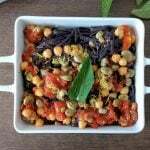 As in the Fast Metabolism Diet, cheese is not allowed, I have not been able to respect the tradition as it is, so I have decided to create a special dish for this day: black rice pasta with fava beans and chickpeas. Phase 1 · Phase 3 Serves: 2 - 3 Prep Time: 30 min. Cooking Time: 10 min. This recipe is compatible with the Fast Metabolism Diet – FMD Phase 1 and Phase 3. Phase 1: With these quantities, you get 3 dinners for <20 pounds or 2 dinners for >20 pounds. For a complete dinner add phase vegetables. You can make this dish for P1 lunch adding phase vegetables and fruit. Phase 3: All quantities are the same, the only one that changes is the amount of pasta, which is reduced by half; in this way you get 3 dinners for <20 pounds or 2 dinners for >20 pounds. For a complete dinner add phase vegetables and healthy fats.